The 150th anniversary of the processional statue of the Annunciation in Balzan was going to be celebrated this coming Sunday, but research last year revealed that the anniversary actually falls next year. Carmel Bezzina clarifies matters. The processional statue of the Annunciation at Balzan parish church. Our local communities have always held in high esteem the patron saints of their towns and villages and, throughout the years, they have duly celebrated their feasts. Their love and devotion is borne out in the names given to their newborn children, in olden days much more than today, in street names in various localities and in stone statues adorning street corners, particularly in Valletta and traditional villages. Many paintings and works of art in our churches also attest to this devotion. Throughout the years there emerged the tradition of having a processional statue of the patron saint which would be carried shoulder high throughout the streets of the locality at the annual festa. This tradition goes back in time to the 17th century, and reached its climax in the 19th century. The production of processional statues, usually carved in wood and, later, made of papier-mâché, proceeded at a steady pace. The manufacture of processional statues is not limited to those representing titular saints but also others which enjoy popularity among village communities. As an example, statues of Our Lady of the Rosary are found practically in all parish churches in Malta and Gozo. The first processional statue at the Balzan parish church was, in fact, that of the Madonna of the Rosary, a fine baroque statue sculpted in wood between the years 1773 and 1774 by Vincenzo Dimech (1744-1803). This processional statue is a reproduction of the Madonna of the Rosary venerated at the church of the Dominican fathers at Rabat, an early work by Melchiorre Cafà (1636–1667). 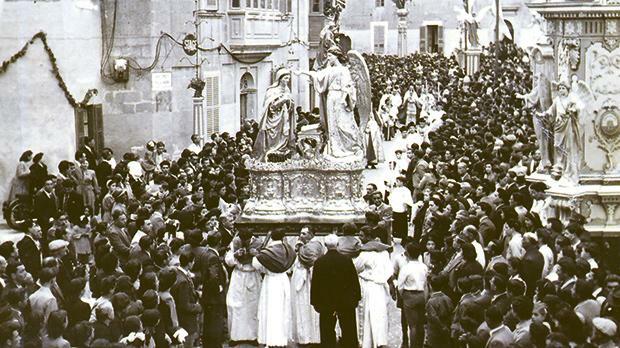 The statue at Balzan used to be carried processionally through the streets of the village on the feast of the Annunciation as far back as 1777, when the parish did not have as yet a statue of the Virgin Annunciate. The statue of the Annunciation, sculpted in wood by Salvatore Dimech and inaugurated in March 1869. Like parishioners from other towns and villages on the island, the people of Balzan had long been yearning to have a statue representing the mystery of the Annunciation, to whom their parish had been dedicated prior to its erection to parish status on August 14, 1655. This can be attested from the fact that, in 1575, when Mgr Pietro Dusina made an apostolic visit to Balzan, the small rural church of the Annunciation was considered the principal church of the village. As time went by, the people of Balzan felt that the time was ripe for their dream to come true. 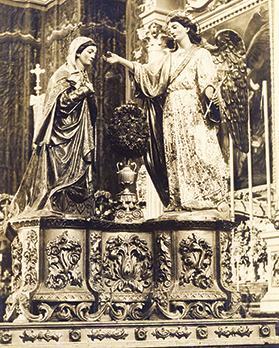 On July 15, 1864, Pasquale Muscat and Mario Borg, representing the village community, presented a petition to Mgr Gaetano Pace Forno, Bishop of Malta, requesting his permission to order a statue of the Annunciation. The parishioners were ready to contribute towards this project and they eagerly awaited the bishop’s approval. Having perused the petition, Bishop Pace Forno requested more information from the parish priest, who at that time was Rev. Paul Licinius Micallef. Three days later, the parish priest conveyed to Mgr Pace Forno that he found no objection to the statue, as the actual one (Our Lady of the Rosary) was not suited “per il giorno festivo del titolare di questa Sacra Parrocchiale Chiesa, che al certo assai desiderabile che si sostituisca una altra che rappresenta l’Annunziazione della Beata Vergine titolare di detta Chiesa.” (Ibid., ff. 334–335). The parish priest, however, expressed his idea that a model of the new statue should first be presented in order to gain the bishop’s approval. Bishop Pace Forno approved the petition on July 23, 1864 (Ibid., f. 337). However, notwithstanding the bishop’s approval and the enthusiasm of the villagers, the project of the new statue took quite some time to be taken in hand. The feast at Balzan on April 24, 1949. Well over two years had elapsed since the presentation of the petition and the eventual approval by the bishop. The reason for this delay is not known. In the meantime, the representatives of the Balzan community set their eyes on Salvatore Dimech (1804-1886), popularly known as ‘Is-Sarċ’, and entrusted him with the carving of the statue of the Annunciation. Dimech was from Mosta, but resided at Lija. He had already made a name for himself as a sculptor, and between the years 1860 and 1866 he was busy with the sculptural decoration of the Royal Opera House in Valletta. The formal contract between Pasquale Muscat and Mario Borg, on behalf of the people of Balzan, and sculptor Dimech for the processional statue of the Annunciation was held at the office of Notary Annunziato Frendo Micallef, in Three Churches Street, Balzan, on February 3, 1867. The contract stipulated that the statuary group should be made up of the two protagonists of Luke’s Gospel narrative: the Virgin Mary and the Archangel Gabriel. (Ibid., f. 327). In the two years following the signing of the contract, there exists no document regarding works on the statue. The next important information found is dated March 21, 1869. Dimech declares that he had received the sum of 921 scudi and three tarì from Muscat and Borg in settlement of the wooden statue of the Annunciation and its pedestal. (Ibid., R 276/32, ff. 1346–1347). This means that it can safely be assumed that the actual work on the statue was carried out between February 1867 and March 1869. However, regarding the delivery of the statue, there is no official written information. The titular statue of the Annunciation back in Balzan in 1930, after undergoing some alterations by artist Abram Gatt and executed by sculptor Manwel Buhagiar. 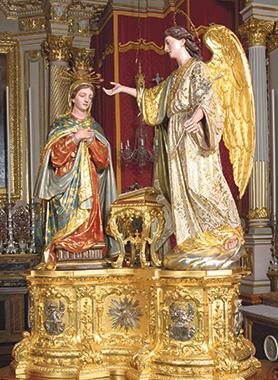 Traditionally, the Balzan processional statue of the Annunciation has always been dated 1868. It was Pietro Paolo Castagna (1827-1907), a contemporary of Salvatore Dimech, in his Lis-Storja ta’ Malta bil Gżejer Tahha (Malta: 1888, Appendix (1890), pp.152, 207), who presumably first came out with this date. Later reseachers and writers of history, including Mgr John Dimech in his seminal work Ħal Balzan – Ġrajjietu sa l-1999 (Malta: Kunsill Lokali Balzan, 2004, p.148), followed Castagna. 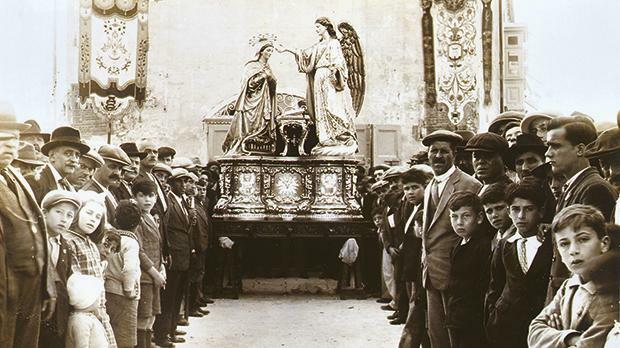 Consequently, the first centenary of the titular statue was celebrated in Balzan in March 1968. Moreover, its 150th anniversary was due to be held this year on Sunday, the eve of the Solemnity of the Annunciation of the Lord, which this year has been transferred because the liturgical day of March 25 fell on Palm Sunday. An important development in this regard came about in October 2017 when attention was drawn to a news item which appeared in the Italian-language newspaper Corriere Mercantile Maltese, dated Wednesday, March 31, 1869. In an arts write-up, the unnamed correspondent gives an artistic appreciation of the processional statue of the Balzan Annunciation and describes in some detail its arrival at the village. The statue was brought to the village the Sunday before March 28, which happened to be Easter Sunday. This unique and historic occasion for the village, unfortunately, was not bound to occur on the liturgical day proper, as that year March 25 happened to be Maundy Thursday. According to the correspondent, the arrival in Balzan of the processional statue was a day of jubilation and celebration for the local community. He then proceeds to describe the statue and praises its artistic merits, a work sculpted in wood, exhibiting artistic skill and technique. On that day, comments the correspondent, an enthusiastic crowd assembled to accompany processionally the statue from Mdina, where the statue was taken for painting and gilding. The cortège got under way from the church of the Augustinan friars at Rabat, to the accompaniment of a band. The crowd was so numerous that it was practically impossible to give due praise to the persons who were responsible for promoting this work of art, which does credit to the inhabitants of the village. However, the correspondent mentions by name and congratulates Salvatore Dimech and his son Paolo, together with the gilder Giuseppe Bartolo of Rabat, the authors of this “bel lavoro di artisti maltesi” (beautiful work by Maltese artists). The correspondent concludes his contribution by reminding readers that the following Monday, April 5, the village of Balzan would be celebrating its titular feast of the Annunciation, postponed from March 25, as already stated. On the eve of the feast, there would be fireworks and band marches, and on the feast day proper the statue of the Annunciation would be carried shoulder high through the streets of the village for the first time. The correspondent concludes his piece by praising the generosity of the parishioners, the fervent devotion of the procurators and the enthusiastic leadership of the parish priest, Fr Paul Licinius Micallef. In the coming months, the Balzan community will be marking the 150th anniversary of this historic event. In the run-up to this special occasion, and as a means of spiritual preparation for this event, short reflections are being delivered throughout Holy Mass on the 25th of each month. In May a dramatic performance, entitled Hawn Jien (Here I am), will be staged at the parish hall. The subject of this performance focuses on the theme of Mary’s acceptance of God’s will in her life, by assuming the notherhood of Jesus Christ, the Son of God. The festivities will reach their climax on March 24 and 25, 2019, the Solemnity of the Annunciation of the Lord. On March 24, the residents of Balzan will have the occasion to welcome and accompany the statue of the Annunciation as it passes through the streets of the village. This pilgrimage will be an occasion for prayer and celebration, with the participation of the two musical bands of the village, the St Gabriel Band and the Maria Annunziata Philharmonic Society. The following day, as has been the custom each year, Low Mass will be held at the old church of the Annunciation, in Three Churches Street, and solemn High Mass will be celebrated in the evening at the parish church with the participation of choristers and orchestra. Apart from these activities, a commemorative book, consisting of three researched papers and various images of historical significance, will also be published for the occasion. In December, Balzan will also be marking the 350th anniversary from the laying of the foundation stone of the parish church. All these activities will be a fitting testimonial which bears witness to the devotion of the Balzan community towards Mary, Mother of God and to their pride in their village and its history.